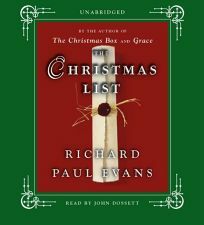 Evans returns to his hit series with this latest story of one unfortunate soul whose life seems to be falling to shambles around him after he reads his own obituary in the newspaper three weeks before Christmas. Dossett gives a heartfelt and stirring reading, with nostalgic shades of Capra's ""It's a Wonderful Life"". He reads with a steady voice, wading deep in character without ever drowning himself in the descriptive tide. ""A Simon & Schuster hardcover. (Oct.)"" .